If you’re looking for AZ Dome, you’re in the right place! AZ Dome is now known as Marken Corporation, but we still offer the same quality services and options that’ve made us one of the most respected contractors in Phoenix. Send us an email or give us a call to set up a free estimate. 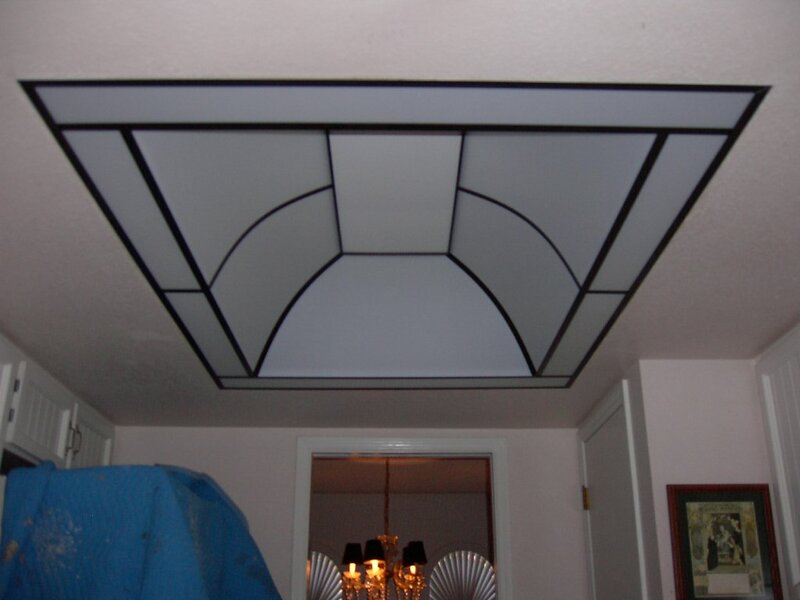 Specializing in quality Home Remodeling and Construction, as well as custom lighting in the greater Phoenix area, Marken Corporation, DBA Arizona Dome & Remodel, a licensed, bonded and insured company since 1987, welcomes you to investigate our many services. • home concierge services, which is a home watch program and a full-service home management and maintenance company designed to eliminate the stress and concern of caring for your first or second home. 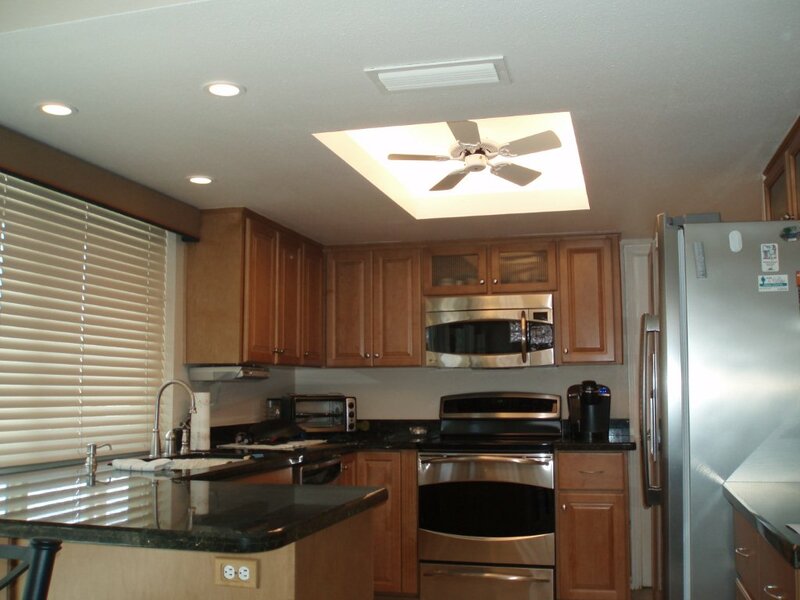 We specialize in quality Home Remodeling and Construction, as well as custom lighting in the greater Phoenix area. All of our employees are aware that our customers are our most important asset, and are instructed to treat our customers with the utmost respect and satisfaction. 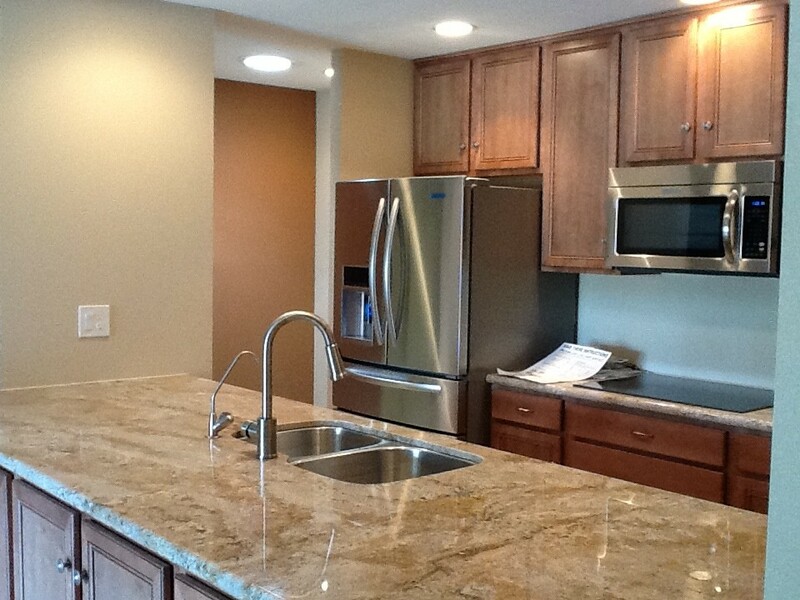 We are a smaller specialty remodeling company so we can offer better quality at a low price and with minimal hassle. Your remodel job is run directly by the contractor on-site daily, not a project manager or salesman. You want your contractor to be on-site daily to insure the project runs smoothly and is completed in a timely fashion. We assure that your project is completed to our highest standards and that you are kept informed at all times. No job is too big or too small for us. We work in all areas of greater Phoenix. the stress and concern of caring for your first or second home. and keeping your home in tip-top shape whether you are home or away. As a custom builder recognized by the state of Arizona and the Registrar of Contractors, we have the craftsmanship necessary for successful home remodeling ideas, design and completion. 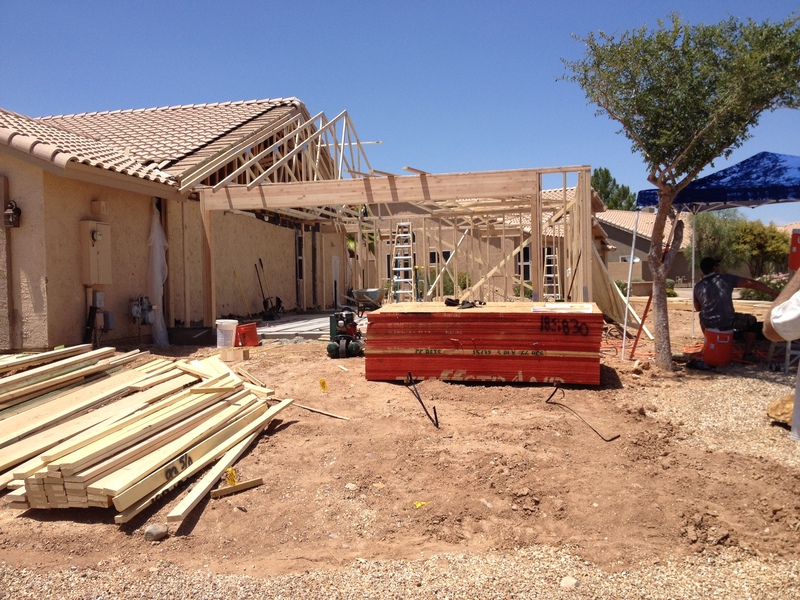 To find out why we are Phoenix, Arizona area’s leading custom home remodeling contractor by requesting a quote today. Please call us at 602-996-2603 today and schedule your FREE in home estimate today. Kitchens, Bathroom, Home Theaters…we can fulfill all your remodel needs. A dome ceiling is typically installed in the kitchen of the home, however, it does work well in other rooms and in offices too. The lighting source is derived from new energy efficient fluorescent lights placed around the perimeter of the dome ceiling. 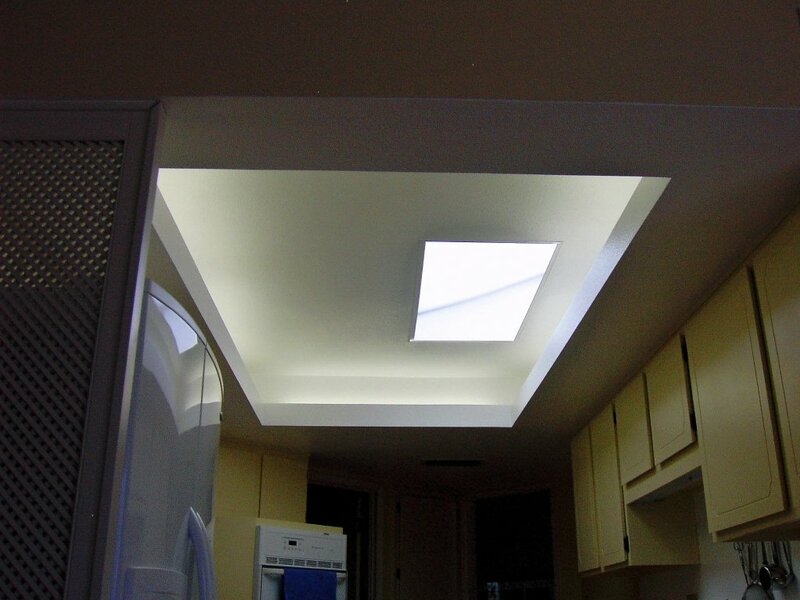 This gives the customer the greatest light diffusion to illuminate the kitchen. 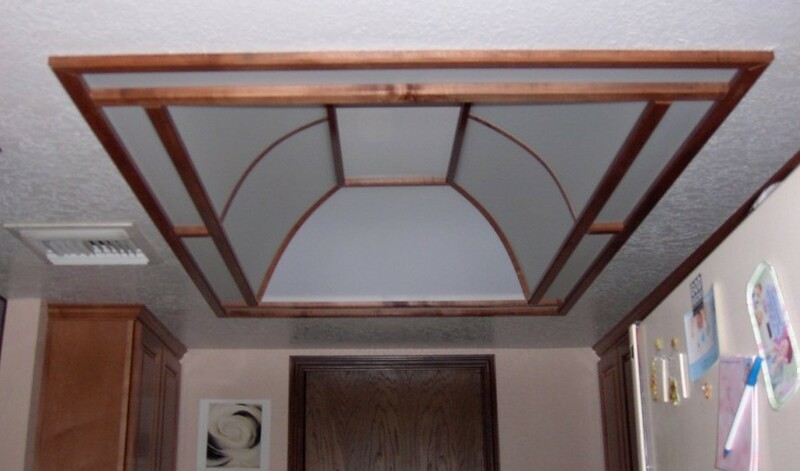 The frame work of a dome is built from either aluminum “T” grid or solid wood moldings. The “t” grid comes in three colors ~ powder coated white or almond and bright dip polished brass. The wood molding comes in oak, maple, or hickory, any of which are custom stained to match the cabinets. All of the trims look excellent and will give your kitchen a bright, airy, custom look. The ceiling fan, available in the same three colors ~ white, almond, and brass ~ is 5-bladed and has a limited lifetime warranty. Also included in the installation, we can wire the fan to its own 4-speed fan switch which allows the customer to operate the fan independent of the lights. • The radius of the curved plastic gives you more height and a beautiful spaciousness to the room. • With the light around the perimeter of the opening, the room gets an even amount of light over the counter tops, where you need light the most. • The ceiling fan provides air movement in an already warm and stagnant room. With the fan wired to its own switch you can operate the fan independent of the dome ceiling lights. • An option is to wire the lights to separate switches to give you different levels of light or a night light. • Nearly all dome ceilings are installed in one day with little interruption of your daily routine. 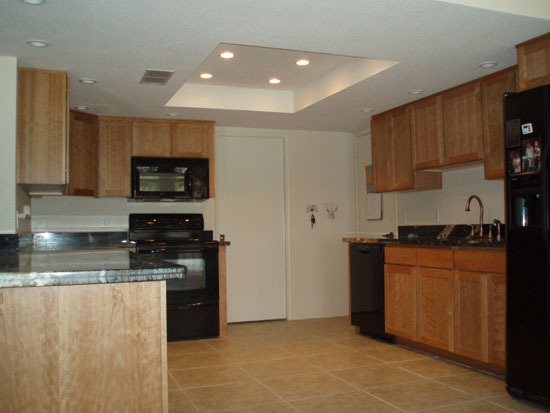 From Kitchen Cabinets to complete Design and Build, our Kitchen Remodeling quality and value are the best in the Phoenix area. 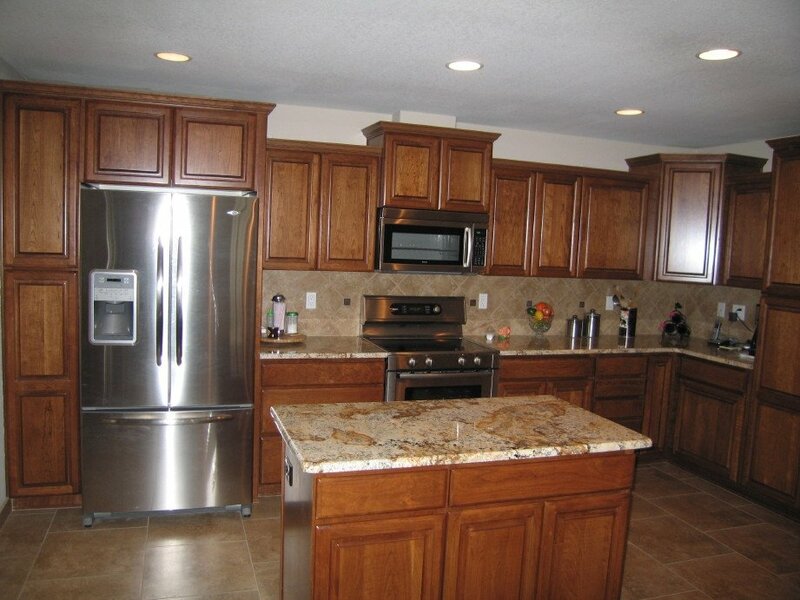 We offer all inclusive remodeling services to make your dream kitchen a reality. Our Bathroom Remodeling services are very detailed and cost effective. We offer tile floors, tile shower/bath enclosures, new vanities, lighting…all your bathroom remodel needs. In your kitchen, lighting is as important as anything else in the room, and is often overlooked.. 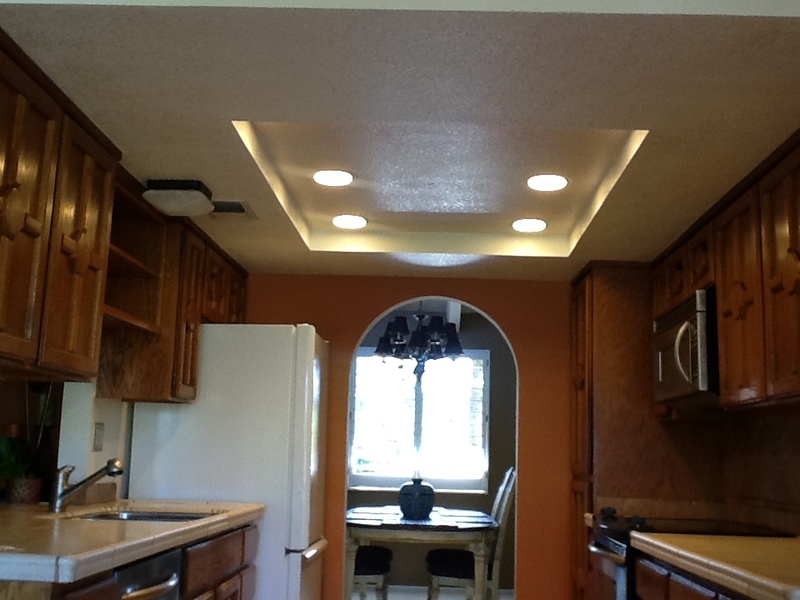 Kitchen lighting can highlight your new countertops, cabinets, and appliances. With our on-staff lighting designer available to you, you can be assured of a bright and beautiful kitchen. Direct lighting is achieved by using conventional lighting, dome ceilings, or light fixtures that are on a pendant or chain. These types of lights work well to provide the bright lighting for work surfaces and general purpose lighting in the kitchen area. Recessed lighting offers a clean, streamlined look in a home by increasing the amount of light in a room, highlighting a special feature, and open up spaces so they look and feel bigger. 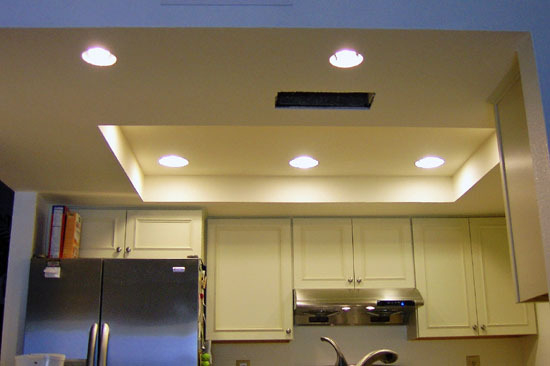 Recessed lighting is also known as pot light, down-light, can-light, and down cans. 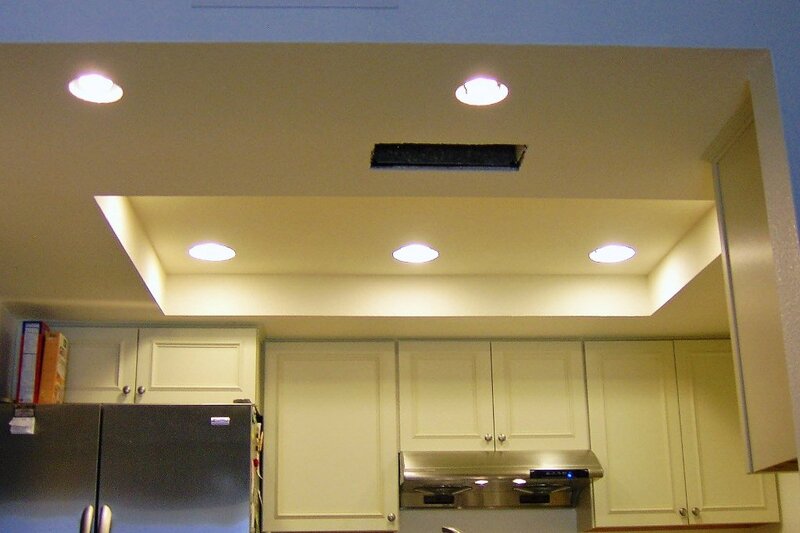 There are many options available in the design and functionality of recessed lighting. 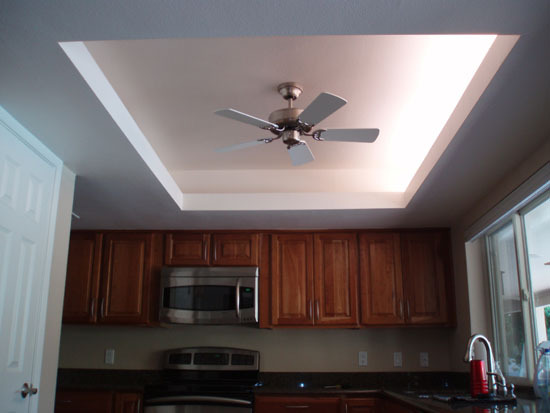 In addition to brightening the room, it can put direct lighting on key areas such as a countertop or cooking area. 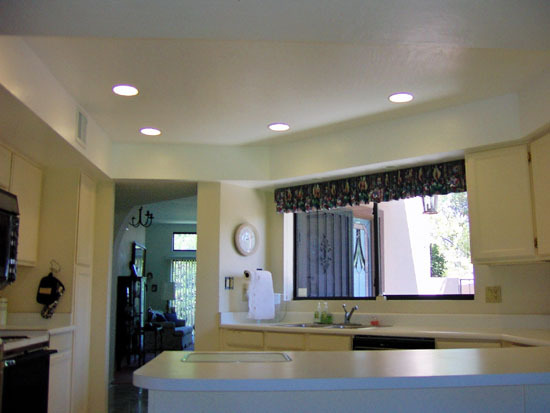 Also, recessed fixtures can be used as a general lighting source for the open area of the kitchen with or without the traditional surface mounted fluorescent fixture. 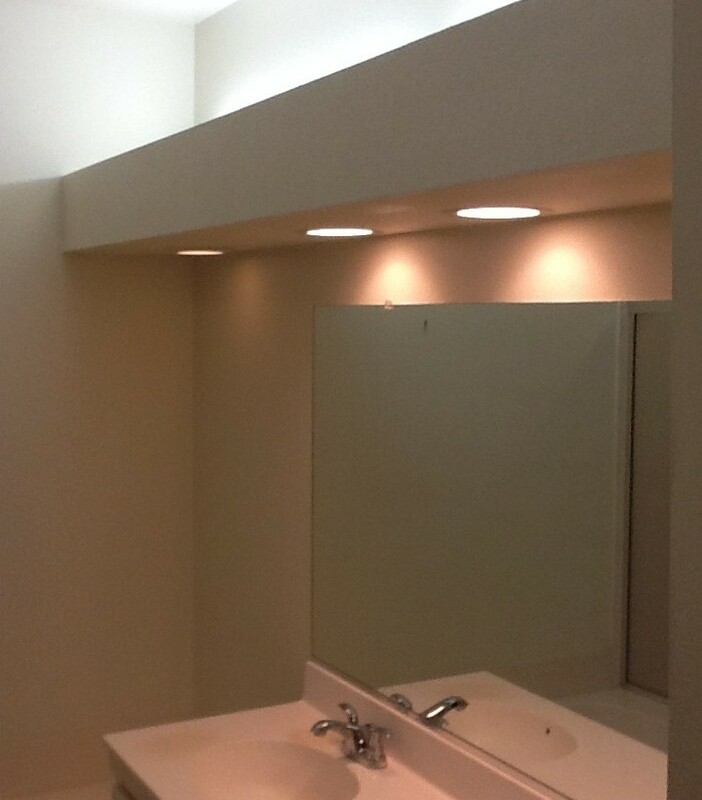 Indirect Lighting is created by hiding the light source from view. The light produced by the hidden fixture bounces off a ceiling or a wall and produces a warm glow that adds atmosphere. The light fixtures can be hidden on top of or under wall cabinets or they can be installed in open troughs or layered ceiling areas that surround the entire kitchen space. 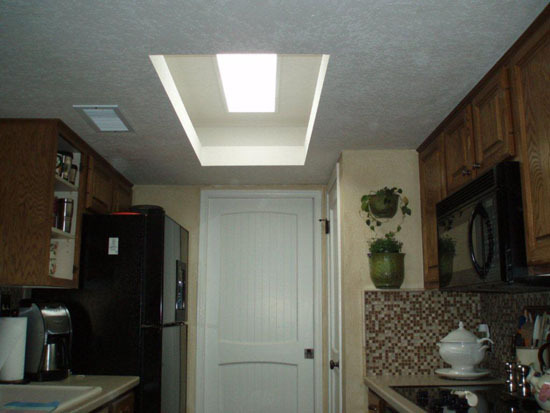 Arizona Dome & Remodel can add additional square feet to your home at a reasonable price. Expand a bedroom, add a family room, add a bathroom… make your dreams come true. Make your current home your dream home… and we can do it all! !